"NATURE MORT DE LA GUITARE"
Ismael Gonz�lez de la Serna was born in 1898 in Granada, Spain. He began painting and drawing when he was nine years old. While in school, he became friends with Federico Garcia Lorca, later to become a famous poet. Indeed, it was de la serna who in 1918 illustrated Garcia Lorca's first book, Impresiones y Paisajes. De la Serna pursued his studies at the Academy of Fine Arts in Granada, where he learned the traditional rules of composition, form, and color. A turning point came in his life in 1917, when he viewed an exhibition of French Impressionists in Madrid. By his own testimony, thereafter he was determined to be a free painter, devoted to new forms. The Spanish artistic community, unlike that in neighboring France, was resistant to the innovations of Post-impressionism. Granada in particular imposed intolerable limits on such an extraordinary soul as de la Serna's, as it was described by Lorca. The year 1927 was one of remarkable success for de la Serna. T�riade devoted an article on him in issues of the art review, Cahiers d'Art, which simultaneously covered the works of luminaries such as Renoir and Picasso. T�riade wrote that de la Serna was the painter we had all been waiting for. That is, his poetic sensibility lent in certain unity to his work and deftly combined a vigor of expression with a delicacy of form. Paul Guillaume then organized an exhibition of fifty of de la Serna's works to wide acclaim. An individual exhibition at the Gallery Flechtheim in Berlin was equally successful, all of the works found buyers. The gallery even signed de la Serna to a contract, which remained in effect until 1933, when Hitler's rise to power forced its revocation. The Nazi rise to power definitely had unfortunate consequences. It is thought that those works of de la Serna's still residing in Germany, including many of his most vulnerable paintings, were destroyed by the Nazi regime. Luckily, de la Serna had been warmly received throughout Europe. In 1928, he signed contracts to exhibit his works at the Galerie Zak in Paris and at the Galerie Le Centaure in Brussels. Christian Zervos wrote enthusiastically in Cahiers d'Art that de la Serna's incredible skill at drawing allowed him to make abstractions of reality. While a number of his works certainly echo the influence of Picasso and Braque, such influence was mirrored within a Cubism of his own making. In the instinctive equilibrium of his work, the blend of exuberance and sober expression, the use of color, and the strength of the lines, de la Serna reminded Zervos of Zurburan, El Greco, and C�zanne. Indeed, to Zervos, Cubism brought out either a deep expressiveness due to the distortion of the central object or figure represented, or resulted in an abstract painting composed of forms independent of the exterior reality. In any case, representation of both possibilities was typical of de la Serna's work. The artist easily balanced and reconciled the extremes of both representation and abstraction. 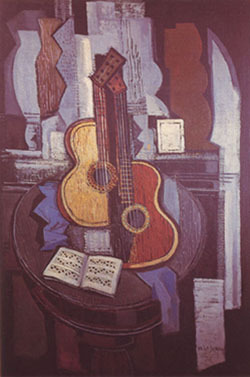 Although a traditional Cubist subject, Nature Mort de la Guitare is a strong example of de la Serna's Cubist technique of the late 1920's. In 1930, the Galerie Zak devoted an entire exhibition to de la Serna;s works. The National Gallery of Berlin,and the museum of Mannheim both acquired paintings of his. In 1932, he returned triumphantly to Spain, where he toured with successful exhibitions throughout his homeland. In 1936, he took part in an exhibition at the Mus�e du Jeu de Paume in Paris. During this time, he rarely participated in public showings of his work. After the Second World War, he released works he had painted secretly which honored the Resistance and decried the atrocities of war. De la Serna continued to work throughout the 1940's and 1950's. His style evolved into pure combinations of color and form. His paintings continued to be shown in France, Germany, Spain, and Mexico. In 1963, he was invited to participate in an exhibition of French paintings at the Tate Gallery in London and in an exhibition at the Hammer Gallery in New York. In 1974, the Mus�e d'Art Moderne de la Ville de Paris organized a retrospective of nearly one hundred of de la Serna's paintings from throughout his career. The retrospective tracked the artist's diversity of subjects and the technical scope of his talent. De la Serna died in Paris in 1968. His personal contributions to the language of art endure.